From Great Britain comes the rising rock band The Enemy UK with their third release, "Streets In The Sky." The band has charted three Top 10 albums in Great Britain and has opened for such superstar groups as Oasis, Kaiser Chiefs and Stereophonics, amongst others. The band began with writing and recording 30 songs that were weened down to these twelve which are out to prove that this band is ready to become and international hit-making machine. The trio explode with the opening song, "Gimme The Sign" as they attack their instruments with a punk-like fury. The rawness of the band's sound is heard in "Bigger Cages (Longer Chains)" as they keep the energy high going into "Saturday." The Enemy UK head into mainstream rock territory with "Like A Dancer" as the band's sound becomes bigger than the three-piece creating it. The album continues with the arena rocker "This Is Real," before tapping the pop/rock vein with "Two Kids." The Enemy UK return with their signature, energetic punk sound on the closing song "Make A Man." The band will be headlining shows and festivals over the course of the next few months. 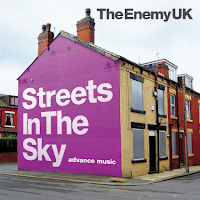 For more information on this rising young British band, please visit the band's Facebook page at www.facebook.om/theenemy.